Fifteen applicants were selected for the workshop coming from varied backgrounds of Engineering, Bio-technology, Architecture, Environmental Sciences, Botany etc. 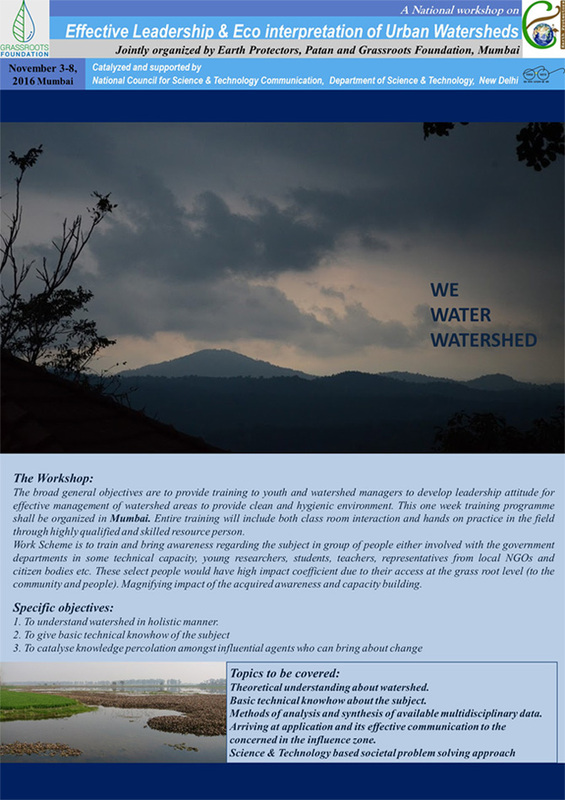 Six-day workshop with experts from Planning, Ecology, Hydrology, GIS, Architecture dispersed their knowledge on watershed management techniques. Each interactive session of the workshop followed by debates and discussions. There were two site visits arranged during which the participants had the hands on experience of different techniques of data collection, analysis and interpretation. Both the classroom and field sessions resulted in contextual explanations and successful solutions to doubts raised. Thane Municipal Corporation's Water sampling Laboratory experience, gave the students hands on experience of technical know-how. Based on the five day, theory and application sessions focusing on watershed related issues and site analysis the students rightly presented selected site of their own interests with detailed understanding of Watershed related areas. The participants were asked to make their presentation on the first day and the mentors were assigned to each participants; after working with their mentor the participants have presented their work on the last day for the final selection. Four participants were selected on the basis of their merit to continue their research, research attitude, leadership quality and interest.